Seven years from now, Dubai will welcome roughly 70 million tourists to its first World Expo, housed inside a gigantic, brand new, solar-powered city. But exactly how smart of an investment is an Expo, these days? And can economically volatile Dubai handle the $7 billion cost? A November 13 photo shows an ad in Dubai. Image: AP/Kamran Jebreili. Dubai beat three other cities to clinch the bid—Ekaterinburg, Izmir, and São Paulo. The projections for how it could help bump up Dubai's GDP are optimistic: it could add as many as 200,000 jobs, and boost the city's GDP by one percent every year until 2020. But there are also plenty of troubling projections. Like so many other cities that have eagerly hosted Expos, Olympics, and World Cups, the ROI is not always what it's cracked up to be. Cities have vied to host the World's Fair (or World Expo), for almost 200 years. Among the chosen host cities, though, there have been winners and losers. Take Shanghai, for example—more than 70 million tourists visited its 2010 Expo, providing a noticeable bump in its GDP. On the other hand, we have the debacle of the 1984 Louisiana World Exposition, during which the company running the show was forced to declare bankruptcy, sending New Orleans into an economic tailspin. There hasn't been an Expo in the U.S. since. The Louisiana World Exposition. Image: Wikipedia. So yes: For booming cities like Shanghai, the Expo can be a boon to draw in investors. For cities on shakier ground, it can be a serious risk. Dubai is definitely on shaky ground; caught in a perpetual bubble/bust scenario, it is only a few years out from its last major economic crisis, in which it nearly defaulted on its debt—in part, because of overbuilding and a glut of real estate built during the boom. 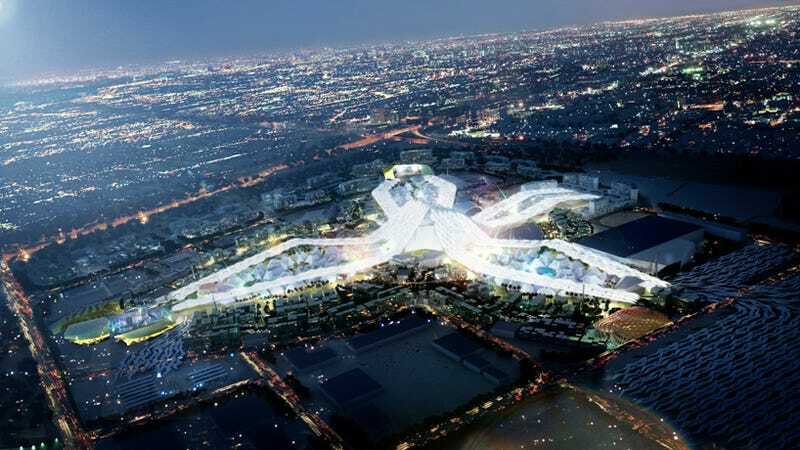 Expo 2020 could easily serve to reignite that cycle. According to a report from Reuters, the bid itself has driven up speculation in the Dubai property market, with prices up 20 percent in the last year. The forthcoming site of the 2020 Expo will add another 1,000 acres of new buildings to the market—at a cost of between $7 and $9 billion over the next seven years. Keep in mind that roughly $42 billion of the city's current debts will come due during the same period—shaky ground, indeed. Under these "souk-like" canopies, exhibitors from more than 150 countries will set up shop during the fair, inside what the architects describe as "innovation pods" and "best practice areas:"
One major unanswered question regards who will be building these massive structures—and how they'll be treated. Dubai, like its neighbor Qatar, has a less than pristine record when it comes to the human rights abuses of migrant construction workers. Another super-expensive, super-fast tracked construction project is not likely to improve that reputation. And then, of course, what will happen to these massive spaces in 2021, when the tourists go home and the city is left with even more housing and commercial stock? According to HOK, the site will become a "Museum of the Future."